The Butternut is usually an infrequent tree in the Macoun Club’s nature study area just outside Ottawa, Ontario, but in places it grows abundantly — around the edges of old fields, along outcrops, and in maple forests, particularly where they are moist. We know it as a small to medium-sized tree, but one that sometimes grows as big as any other species here. It is almost absent from the eastern third of the Study Area. It is related to Walnut trees, and like them, produces a large, edible nut. All across North Amerca, a fungal plague called Butternut canker is sweeping through the Butternut population. This disease was first noted in 1967, and identified in 1979. The fungus, Sirococcus clavigignenti-juglandacearum, kills small patches of bark and causes wounds, called cankers, to appear. 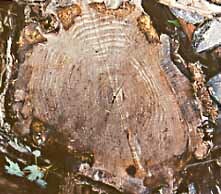 The black stain on the bark at left indicates an active canker, while beside it is a canker that the tree’s resistance defeated, and healed over. Such resistance raises hope for the species. In the winter of 1993/94, Macoun Club leaders Rob Lee and Barbara Gaertner carried out a fairly complete survey of Butternut trees in the Study Area, recording which trees had the disease (below left). After 10 years, they resurveyed the species. How much was there in 1994, and how much now? For an explanation of the colour-coded vegetation, see the main map. Basically: light green (deciduous woods); dark green (coniferous forest); pastel orange (pine or spruce plantations on former farmland). The map at left shows how in 1994, only 35 of the 415 trees then found (8%) had fungal cankers. Only 2 seemed seriously diseased, and just one had died of the disease. In 2004, as they revisited each tree, it was added to a new map, above right. They found a much higher rate of infection (474 of 616 trunks, or about 77%). 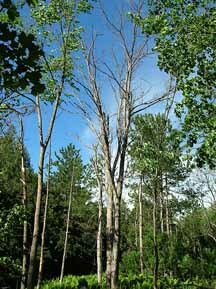 About 50 of the trees appeared to have died from the disease, often because cankers at the moist base of the tree allow the roots to rot out even while the crown is still healthy. 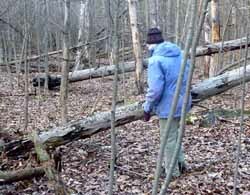 (Another 50 were broken down by the ice storm of 1998, and had died as a result of that damage.) A very few trees had overcome the infection, at least above ground, and showed healed cankers on their trunks. In 2009, Butternut trees seemed to be dying at the fastest rate yet. Rob and Barbara resurveyed a few years earlier than planned, because so many trees are falling down that they doubt they’d be able to find them all if they waited until 2014. In the early summer of 2010, they were finding that almost exactly 50% of the trees that were alive in 2004 are now dead. Few people notice that this has happened, because the Butternuts are immersed in the forest of maples and other trees, but there is one grove — near the “waterfall”, for Macouners who know the place — where the bare limbs stand starkly against the sky. The Study Area’s very biggest Butternut died in 2009, and in 2010 the second-biggest had cankers on its trunk and roots; only 30% of the crown was still alive. Many of the survivors have healthy looking crowns, but their roots are rotting out. Roots are often exposed to the air and fungal infection by the soil deflation caused by a high population of introduced invasive earthworms. Cankers on the roots occur as much as 8 feet (2.1 m) out from the trunk. Many trees are more obviously in faltering health, with just a few branches bearing leaves. All photos donated or provided by members and leaders, past and present. Created May 2002; updated June 4 and Dec. 16, 2003, and July 19 and Dec. 5, 2010. Coding revised June 2016.